Who has never asked themselves how to make a perfect pumpkin for Halloween? In itself, it sounds quite simple - I go and get a pumpkin and, with a knife, I carve spooky motifs, or simply a great facial expression, into the pumpkin. However, all of this is easier said than done, especially when you want to have a particularly attractive design. Below you will find some useful tips and tricks on how to perfectly decorate a Halloween pumpkin. At the very beginning, one frequently asks about how big the pumpkin should be. Generally, it is accepted that the size of the pumpkin doesn't matter. It can therefore be guaranteed that a pumpkin can be found for every place, which pleases its viewers with its presence. It is important to note that the smaller the pumpkin, the more difficult the work, since all the steps must be performed much more accurately. Moreover, the price remains to be mentioned. Clearly, the larger and heavier pumpkin will cost a bit more. When you purchase your pumpkin should make sure that it has no pressure points or bruises, and should have a more matte rather than shiny color. To save money when buying it, we recommend a visit to a nearby farmer. It could probably benefit you to pick a completely fresh pumpkin from the field, thus obtaining a highly-quality products at a fair price. Of course, most of the pumpkin fields have been harvested for Halloween, and therefore one should take care of this in advance to ensure that a pumpkin from the farm is still available. Since pumpkins can be stored in a cool and dry place (on average, up to a month and beyond), it should not bring about losses in quality due to the timely purchase. But if you do not have a storage option, or a farmer in your area, the supermarkets offer some very good products. In the selection of pumpkin sorts, the agony of choice is left to you. In any case, it is important to consider whether or not you will eat the insides of the pumpkin. The edible pumpkin varieties include far more than 200 species and some (like half the varieties Butternut, Chestnut, Delicata, Cucumis Metulifera, Eight Ball, Fairy, Festival, Heart of Gold, Hokkaido, etc.) can even be eaten raw. Please try all sorts and, through trials, determine which varieties are your absolute favorite. It is also good to know that the pumpkin belongs to the family of the cucumber. Once the pumpkin is purchased, the process of designing a really great Halloween pumpkin finally begins. 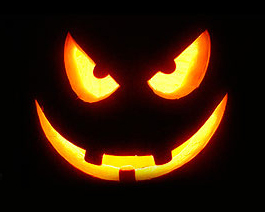 For this, it is important to have a sharp, flexible knife and a spoon to hollow out the pumpkin. When hollowing out the pumpkin, you should be sure that the walls are, on average, 2cm thick (you can cut out a little bit less, since the upper part of the pumpkin also has to hold up the lid). Afterwards, when choosing the motifs, let your fantasies run wild. Once the Halloween pumpkin is carved, a problem quickly arises. The problem is that it will not last much longer in its present form. Unfortunately, it is the fate of the Halloween pumpkin that it be discarded after a certain time. However, there are some simple and cheap tricks to extend the shelf life a bit. For example, one should place the pumpkin out in the open, because the lower temperatures so the mold does not get out of hand as quickly. Furthermore, an extension of shelf-life is obtained by the addition of sawdust (and the appropriate exchange when it becomes wet). The treatment of the pumpkin walls with lemon juice, hair spray, varnish, petroleum jelly or vinegar makes the pumpkin "live" a little longer. Have fun with your Halloween pumpkin! 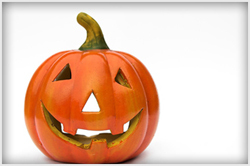 submittals, and nothing will stand between you and your Halloween pumpkin lantern!